Two client segments—Millennials and women—are ahead of the curve. Millennials and women are the new face of philanthropy. Some big trends are happening —forces that have aligned for these investors to take the lead in charitable giving. Their more inclusive, strategic approach means a sharper focus for giving and a greater impact for investing. For wealth management professionals, this trend presents an opportunity to help investors find their path to deeper purpose by collaborating to define goals and develop a high impact, integrated plan for efficient giving and effective investing. Strategic philanthropy empowers clients to take a more proactive and thoughtful approach and leverages their resources creatively to maximize results where they matter most. For wealth management professionals, this can strengthen relationships in deeply personal and meaningful ways—possibly more than any other service aspect could. Like her Millennial peers (born 1981 through 2000) and women across all generations, Stephanie is using wealth to address pressing problems. These two influential investor segments are flexing their individual and collective muscles, reshaping the next chapter of giving. They’re searching for deeper, sustainable solutions—motivated to reframe the conversation. They’re actively seeking ways to get more traction and bandwidth. State Street Global Advisors’ study, “Strategic Philanthropy: Investing with Impact, Donating with Direction”3—as well as recent research published by Dorothy A. Johnson Center for Philanthropy, Indiana University Lilly Family School of Philanthropy and U.S. Trust4—shows how Millennials’ and women’s philanthropic involvement distinctly combines performance with purpose. The days of checkbook philanthropy are fading fast. Investor expectations are changing, calling for the alignment of personal growth and portfolio growth. (See “Achieving Efficient Alignment,” this page.) As investors look to wealth management professionals for help in achieving their personal goals, they’re also increasingly looking for opportunities to use their financial capital for the greater good. Individual investors and family offices are the change agent in product development, as increasing demand is reshaping philanthropy and driving advancements in impact investing. These investors follow in the larger footsteps of institutional investors, who led the way in creating demand for the first environmental, social and governance solutions. High-net-worth individual investors have since raced ahead of institutional investors in driving real change in impact investing, demanding products that meet a broader range of needs, more efficiently and more effectively. While institutional investors have generally focused on screening out unsustainable companies (because of risk), individual investors are more interested in using their financial capital to make progress in issues they care about. Millennials and women investors have some unique shared connections that are shaping how both client segments are thinking about and acting on charitable intent. • Rise of economic power and financial influence, pushing conventional approaches to investing and philanthropy in new directions. • Prioritization of giving and an aspiration to make an impact beyond simply preserving wealth for future generations. A better understanding of how age and gender influence motivations and goals can help organizations engage these influential investors more effectively. Giving is important to all generations and both genders, but the ways in which they give back vary as different factors inspire generosity and influence responsibility. Generally, they fall into two categories: intrinsic (personal satisfaction) and extrinsic (financial). Intrinsic factors. These include a desire to protect the environment or to give back to the community. These factors motivate investors to use their financial capital to foster the kind of change they wish to see in the world. This isn’t exclusive to any particular investor segment. Any individual may be inspired to donate to a charity or to choose a sustainable investment vehicle, whether it’s $5,000 or $5 million. A growing list of options for giving and investing has made it easier for investors to target their financial capital and achieve a greater sense of fulfillment and impact. Millennials aren’t necessarily hardwired to be more charitably minded than other generations. But, their life experiences make them more inclined to act. First, they have more choices—product development has added simplicity, flexibility and individualization for donors. Second, technology has created more transparency (which helps investors determine their ultimate impact) and has increased awareness of issues (which has fostered engagement). $24 trillion in three years’ time.13 This segment is far too influential for wealth management professionals to misunderstand or mismanage. • They’re values-based investors; mindful of the privilege they’ve inherited or that comes from the wealth they’re creating. Millennials seek a balance between honoring family legacy and personal missions. One thing that seems to be true of the younger generation in their late teens to early 30s is that they have a pretty consistent interest in giving back, in doing well by doing good. They have a strong value system and they’re globally aware. Giving for them is not necessarily a tax strategy, it’s a value system. • They’re strategic and purposeful, seeking new tools and strategies to develop greater impact. Millennials are diligent in their research and willing to contribute their talents, not just assets, to solve problems alongside those they support. In return, they expect proven effectiveness or measurable impact from the organization. I raise money and run the Boston Marathon for Mass General Pediatrics. I go in and see the kids the night before the marathon. All those sick kids really inspire me. I know I’m making an impact. • They have a strong sense of community and leverage their peer networks. Once engaged, transparency matters. They track progress to ensure impact is meaningful, and smart charities are taking note. Four million more people in 22 countries now have access to clean drinking water—But, you don’t have to take our word for it. Charity: Water’s latest tech improvement is putting remote sensors on wells—so donors can see just how much water flows from what they helped build. As women earn higher incomes, achieve higher education and control more substantial assets, they’re putting their own mark on strategic philanthropy. They’re also more likely to give—and give more than their male counterparts.17 Research indicates that women are more altruistic and empathetic.18 Intrinsic factors are key motivators—a desire to help others in tangible ways. But, it’s not just a matter of generosity. Increasing access to capital for women—Access to equity, loans and financial training and consideration of larger structural barriers to access, such as land ownership, power dynamics between women borrowers and male bankers and loan officers and even implicit societal biases. Workplace equity—Includes increasing the number of women on boards and in senior leadership positions to alter the gender landscape at the top, as well as instituting policies that benefit women more broadly, such as wage equity and paid maternity leave. This category also applies to issues of supply chain management, in jobs where women tend to hold the lowest paying, most vulnerable and sometimes most dangerous positions. Products and services that benefit women— Encompasses a wide range of business models selling products that range from reproductive/maternal health innovations to daycare services, from water wheels to money management training. In general, investments revealed through this lens respond to a need, whether biologically or socially driven, that’s particularly unique to female consumers. Men and women share many fundamental similarities in their financial lives—both want to drive impact and see change in areas they support. Researchers have documented several ways in which they give differently, including economic and social differences. It’s also important to remember how much life experiences impact perspectives as we go through different life stages —the age effect will also have influence on donor identity, attitudes and behaviors related to philanthropy. 1. Name changed to protect anonymity of research subject. 2. “The Transformative Power of Philanthropy: An Exploration of How the Desire to Make an Impact is Evolving Advisor-Client Relationships,” State Street Global Advisors (2016), https://us.spdrs.com/en/ad/strategic-philanthropy?name=strategic-philanthropy. 5. Supra note 2, see points 1 and 3; “Findings Overview,” U.S. Trust Insights on Wealth and Worth (52 percent of Millennials own or are interested in impact investments, compared to Gen X at 37 percent and Boomers at 29 percent). 6. Dorothy A. Johnson Center for Philanthropy and 21/64, “The Next Gen Donor” research project. 7. Supra note 2 (point 1); U.S. Trust Insights, supra note 5 (34 percent of women own or are interested in impact investments versus 31 percent of men). 8. “The Transformative Power of Philanthropy,” supra note 5; “How and Why Women Give,” Women’s Philanthropy Institute at the Indiana University Lilly Family School of Philanthropy (2015), https://philanthropy.iupui.edu/institutes/womens-philanthropy-institute/research/gender-giving.html. 9. 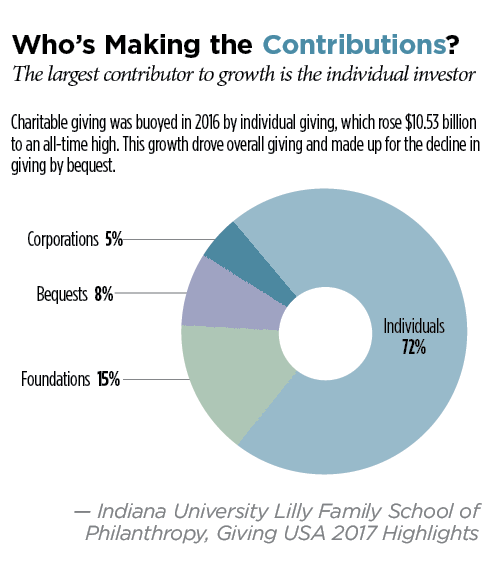 “Giving USA,” Indiana University Lilly Family School of Philanthropy (2017), www.givinginstitute.org/?page=GUSAAnnualReport. 10. 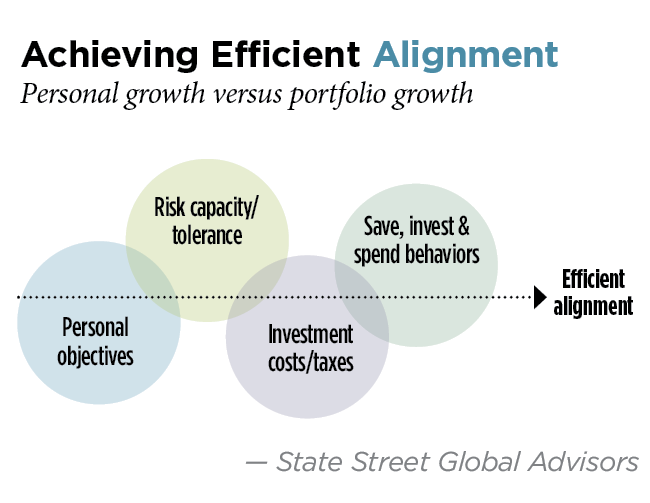 “Sustainable Reality: Understanding the Performance of Sustainable Investment Strategies,” Morgan Stanley Institute for Sustainable Investing (2015), www.morganstanley.com/sustainableinvesting/pdf/sustainable-reality.pdf. 11. “The Generational Collide,” U.S. Trust Insights on Wealth and Worth (2017). 12. Supra note 2 (point 1); U.S. Trust Insights on Wealth and Worth (2017), supra note 5. 13. “Millennials and Wealth Management: Trends and Challenges of The New Clientele,” Deloitte (2016), www2.deloitte.com/content/dam/Deloitte/lu/Documents/financial-services/lu-millennials-wealth-management-trends-challenges-new-clientele-0106205.pdf. 16. “Do Women Give More?” Women’s Philanthropy Institute at the Indiana University Lilly Family School of Philanthropy (2015), supra note 8. 17. Joseph Quinlan and Jackie VanderBrug, Gender Lens Investing: Uncovering Opportunities for Growth, Returns, and Impact (2017); “How and Why Women Give,” supra note 8. 18. See supra note 8 and supra note 2. 19. “A Blueprint for Women’s Funds: On Using Finance as a Tool for Social Change,” Criterion Institute (April 2017).